On the Western Highway, almost exactly halfway between Melbourne and Adelaide, Horsham’s May Park is a popular stopping point for weary travellers. Surrounded by iconic takeaway outlets, the park is also popular with locals. 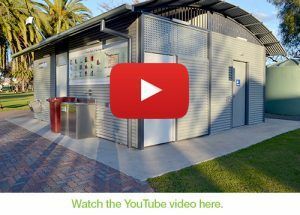 The disability-friendly Changing Places restroom installed by Landmark Products is a smart addition to the park, delivered as part of a major upgrade completed by the local council earlier this year. The Changing Places restroom is smart in many ways. Not only does the facility supply a high-tech 14-square metre cubicle specifically designed for people with profound disability and their carers, but makes efficient use of the space by including seven other toilet facilities. In addition to the restroom, updated barbecue areas, landscaping, fencing, closed-circuit television camera and improved parking were also part of the upgrade, funded by the Victorian State Government. “This project will add to Horsham’s existing visitor economy and cement the city as the perfect rest point between Melbourne and Adelaide,” said Jaala Pulford, Victoria’s Minister for Regional Development. Landmark Products won the Horsham Rural City Council tender for the Changing Places restroom, designing, manufacturing and installing the facility which replaced an aging brick restroom. As with all Changing Places restroom, the main cubicle includes all facilities that meet the needs of people with profound disabilities, including remote-controlled overhead hoist and change table, automatic doors, and a disability-compliant shower. The curved roof for the facility was chosen by the Landmark design team to compliment the park, and a life-like render of the finished project was presented to the Council as part of the overall design proposal. Three external vandal-resistant hand basins, also allowing for water bottle refills for locals and travellers. As part of the service, Landmark Products is providing ongoing plumbing maintenance and support through a local sub-contractor. Much positive feedback has been received from park users, and it is expected the park will attract even more Melbourne-Adelaide travellers, and thereby support local business.